This Fourth of July we spent the day at Washington Park to celebrate. The Eagle was serving huge chicken sandwiches topped with coleslaw, and boy did they look delicious. We were saddened by the fact that they did not have a vegetarian version of this sandwich for us as well as the growing population of vegetarians. The next day, with the sandwich still fresh in our minds, we decided to create a vegetarian version. Luckily, Jenny’s dad happened to be grilling out already so we scurried on over to their house and took advantage of the homemade BBQ sauce he had prepared and the pre-heated grill. Clean the caps with a damp paper towel and remove the stems and the gills. Score the top of the caps in one direction, rotate the caps 90° and score again. This will help the portabella caps become tender. Rub the tops of the caps with a generous amount of olive oil as well as the grill. Season the tops of the caps with salt and pepper to taste. Wipe down the grill with olive oil and place the portabella caps top down. Close the lid and cook for 12 minutes. Check that the caps are tender and top with 1-2 tablespoons of BBQ sauce. Close the lid and cook for an additional 3 minutes. When the caps are tender and the BBQ sauce is warm, remove from the grill and rest for 3-5 minutes under aluminum foil. When the mushrooms have finished resting and you are ready to eat, slice the portabellas in half, and stack on the slider bun. 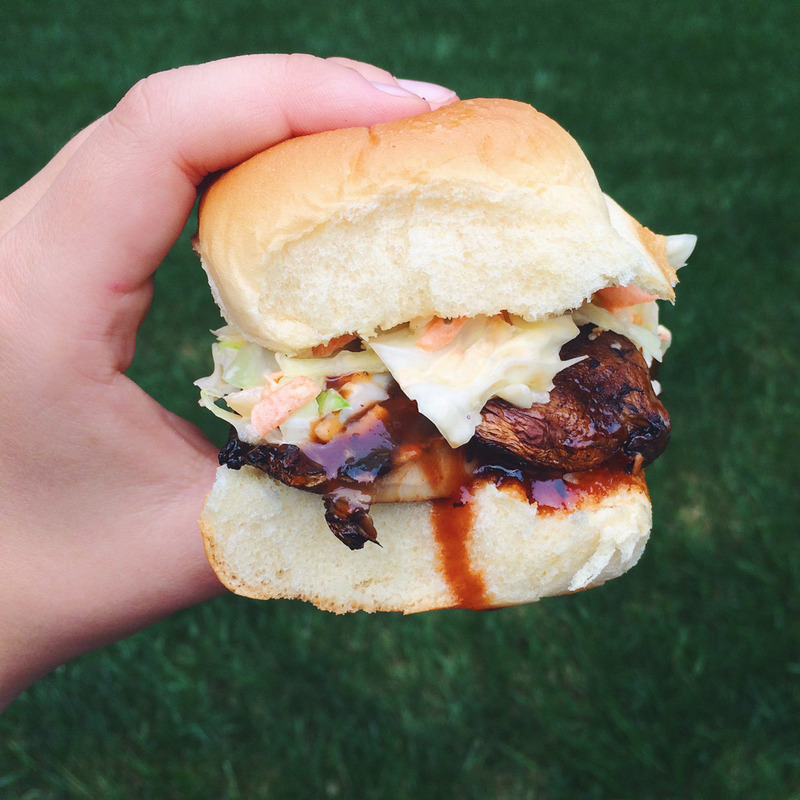 Top with any additional BBQ sauce you may want and about ¼ cup of coleslaw. We like to eat these babies with a side of coleslaw and sweet potato fries. Let us know your favorite BBQ sandwich toppings and sides! Your creation may become our new favorite.